The ice picks in the group have wooden handles made from long rods or dowels, which I refer to as cylinder. The majority of the picks in the first section fall into two general diameter sizes, 1) about 1.1" and 2) approximately 0.85". The handles of the picks in the Barrel section have a slight bulge near the mid-point, giving a barrel shape. Those in the third section have tapered handle while the last section the handles have flats on two or three sides. L = 13-1/8", Probably a home made ice pick. No markings. L = 8-5/8", CARROLL COUNTY UTILITY CO. Carroll just happens to be my middle name! L = 8-3/4", HOUSEHOLD SPECIALITIES CO. on front of ferrule. L = 8-1/8", BRIDDELL MADE IN USA on end of ferrule. L = 8-3/8", PMC MFG CORP on end of ferrule. L = 7-7/8", No ferrule. No markings. Hand carving of old mans face in handle. Missing the ferrule. L - Red - 8-1/4", Others - 10", Handle Dia - 1-1/3"
Appears to be home made. No Markings. SAVE FOOD FLAVOR HEALTH WITH ICE, VIRGINIA APPLE STORAGE on the handle. Missing the corkscrew/cap lifter at the end of the handle. L = 10-1/8", Ferrules on each end of handle, flat metal cap lifter on end of handle. No markings. L = 10-3/4", Cap lifter at ferrule and cork screw stored in the end of the handle. PURCHASE YOUR ICE WITH COUPON BOOKS COMPLIMENTS OF THE WATER & ???? CO ??......?? RELEIVED printed on the handle. Small cap lifter at the ferrule is just over 1/4" long. L = 10-1/4", Cap lifter with two tabs on end of handle. L = 8-7/8" Cap lifter at the ferrule. No markings. TORRINGTON, PN-1A, MADE IN USA around the lip of the ferrule. No other markings. L = 8-3/8", THE CAPITAL TIMES on the handle. L = 8-7/8", MARTOCELLO PHILA. on front of ferrule. L = 8-3/4", Coca Cola on the handle. L = 9", C.T.SHELLHAMMER ICE DEALER & GENERAL HAULING, Ferrule has a different style of crimping. L = 9-1/4", No ferrule, home made. No markings. WILSON & CO, The Key to MOR Good Eating, MOR, BEEF, LAMB, VEAL, PORK, It's Different! on the handle, 5 groves in the handle near the pick, Split in the end of the pick. Not sure this is an ice pick. Cap lifter at the ferrule. The handle is badly burned. L - 10-7/8", Stroke - 7/8", Metal housing for the spring is 3" long. The housing is split on both sides for assembly. L = 7", Slight barrel shaped handle. No markings. L = 7-5/8"' Slight barrel shaped handle. No markings. L = 6-3/4", Slight barrel shaped handle, IDEAL and PAT. in raised letters on each side in a fattened portion of the pick near the handle. L = 6-1/2", Slight barrel shaped handle. No ferrule or markings. Barrel shaped handle with clip on the end of the handle for hanging. No markings. Cap lifter on the end of the handle has two tabs. The ferrule is missing. No markings. 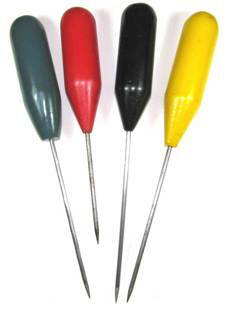 L = 8" (8-3/8" encased), Ice pick has a tapered handle and a protective sleeve for the tine when not in use. No markings. L - 7-1/2", (8" encased). Ice pick has a tapered handle and a protective sleeve for the tine when not in use. No markings. L = 8-7/8", Slightly tapered, Oak handle. No markings. L = 7-7/8", Long ferrule, tapered handle. No markings. L = 7-1/8", Long ferrule. No special markings. L - 7-1/4", No markings, long ferrule. Comparison of the three picks. Slight differences in the size of the handles and the shape of the ferrules. Handle slightly tapered. No ferrule. No markings. L = 10-3/8", flats on two Sides and Cap lifter. No markings. L = 8", Slight barrel shaped with flats on opposite sides. Ferrule is missing. Arctic Ice & Coal Co. on one flat and ICE -COAL-WOOD, Dial 2-1355 on the other flat. L = 8-1/2", Handle flatten on three sides. No markings and missing the ferrule. MYERS & MYERS ICE on one side of the handle and 310 South Potomac St. Waynesboro, Pa. Phone 601J & 47W on the other side. Barrel shaped handle with two flats on opposite sides. CONSUMERS ICE & COAL PHONE 5-0139, on one side and Pick Our Ice And Burn Our Coal on the other side.